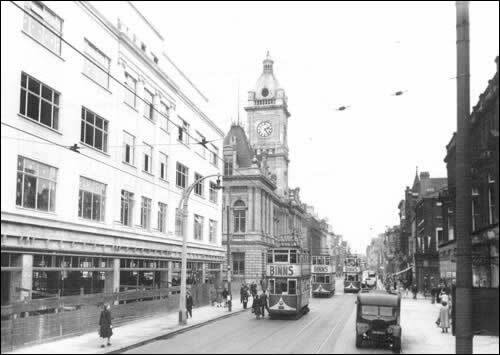 A superb photograph of Fawcett Street in Sunderland, taken around August 1952. Many trams and old vehicles can be seen passing up the street. Sent in by © Allan Edwards. The main point of interest must be the buiding on the left. This is the famous Binn's store undergoing refurbishment. I do know that during the war the railway station behind took a direct hit, so was this correcting war damage or modernisation of the store? The new Binns store is under construction, the old store having been destroyed by German incendiary bombs on 9th April 1941. This new store opened in February 1953. For tram enthusiasts, the trams are: from left to right, numbers 56, 70, 80, 30(2) and 22. Typical of the Sunderland tram fleet, there are no two absolutely alike.